CareveLess – Ultimate Weight Loss Helps Control and Curb Your Appetite. CareveLess (Careve Less) is an appetite control formula that also aids in digestion, absorption, and assimilation. Careve Less works with the body to reduce hunger and curb sugar and carbohydrate cravings. And since it enhances the digestive process, you get maximum energy from the food you eat. Supplement Facts Serving Size 3 Tablets Servings Per Container 20 Calcium (as calcium carbonate) 338 mg 34% Magnesium 25 mg 6% (as magnesium aspartate) Potassium 128 mg 4% (as citrate and aspartate) Garcinia Cambogia Extract (fruit) 600 mg Proprietary Herbal Blend: 1260 mg Triphala (fruit)(Teminalia chebula, Terminali belercia and Emblica officinalis), Cascara Sagrada (bark), N-Acetyl-D Glucosamine, Borage Oil, L-Glutamine, L-Phenylalanine, L-Tyrosine, Chickweed (aerial), Dandelion (root), Echinacea Angustifolia (root), Astragalus Membranaceas (root), Uva Ursi (leaf), Parsley (aerial), Horsetail (aerial), Corn Silk (stylus), Atractylodes macrocephala (root) Other ingredients: Cellulose, Stearic Acid, croscarmellose Sodium, sodium starch glycolate, hydroxypropyl cellulose, silicon dioxide, natural anise flavor, magnesium stearate, maltodextrin and vegetable oil. Directions: As a dietary supplement, take 2 to 3 CareveLess tablets twice a day, 30 minutes before meals. BurnMore – Ultimate Weight Loss Thermogenic Fat Burn Formula BurnMore (Burn More) is designed to help your body burn fat and increase your metabolism. Burn More contains thermogenic ingredients that work gently and naturally to increase your body’s production of heat energy and metabolic rate. Many other weight loss products contain harsh thermogenic stimulants such as caffeine, and the chinese herb Ma Huang (Ephedra) which can make your body feel jittery. BurnMore themogenic ingredients do not produce negative side effects- just results. Supplement Facts Serving Size 3 Tablets Amount Per Serving %DV Vitamin B6 30 mg 1500% Pantothenic Acid (as calcium pantothenate) 100 mg 1000% Chromium (as chromium polynicotinate) 300 mg 250% L-Carnitine (l-carnitine free base) 250 mg Betaine (betaine hydrochloride) 100 mg Proprietary Lipotropic Blend: 800 mg Choline (as choline bitrate), Inositol, Methionine (l-methionine HCL), Lecithin, Proprietary Herbal Blend: 700 mg Gotu Kola (leaf), Ginger (root), Black Pepper Extract (fruit), Gugulipid Burseraceae Extract (gum resin), Bladderwrack (root, leaf), Cayenne (fruit), Mustard (seed), Siberian Ginseng (root), Borage Oil (seed), Licorice (root), Kelp (leaf) Other ingredients: Cellulose, stearic acid, croscarmellose sodium, sodium starch glycolate, hydroxprophyll cellulose, silicon dioxide, natural anise flavor, magnesium stearate, maltodextrin and vegetable oil. Directions: As a dietary supplement, take take 2 to 3 BurnMore tablets twice a day, 30 minutes before meals. Ultimate Weight Loss – Burn More & Crave Less. Comprehensive thermogenic and appetite control program. Avoids putting the body into starvation mode – you lose the weight healthy. Clinically developed by Dr. Lindsey Duncan, C.N., N.D. Rather than a “quick-fix” weight loss gimmick, Ultimate Weight Loss is a clinically researched program which addresses the physical imbalances that can contribute to weight gain without the use of caffeine, ephedra, or other harsh stimulants. Clinically proven Ultimate Weight Loss consists of BurnMore, a thermogenic formula designed to help the body burn fat, and CraveLess?, an appetite control formula designed to aid in digestion, absorption, and assimilation of nutrients. Ultimate Weight Loss Kit – 2 Part Stimulant Free Program For Fat Burning And Appetite Control. Part 1 – BurnMore: Burnmore is designed to help your body burn fat and increase your metabolism. BurnMore contains thermogenic ingredients that work gently and naturally to increase your body’s production of heat energy and metabolic rate. Many other weight loss products contain harsh thermogenic stimulants such as caffeine, and the chinese herb Ma Huang (Ephedra) which can make your body feel jittery. Our themogenic ingredients do not produce negative side effects- just results. Part 2 – CraveLess: CraveLess is designed to help control and curb your appetite. CraveLess contains ingredients that not only help control and curb yout appetite, but also enhance the absorption and utilization of nutrients. That doesn’t mean you’ll absorb more fat or calories by taking it. Perfect absorption offers this: if you absorb and utilize nutrients properly, your body works more efficiently. If your body uses all the nutrients you take in, they can’t be absorbed as fat. 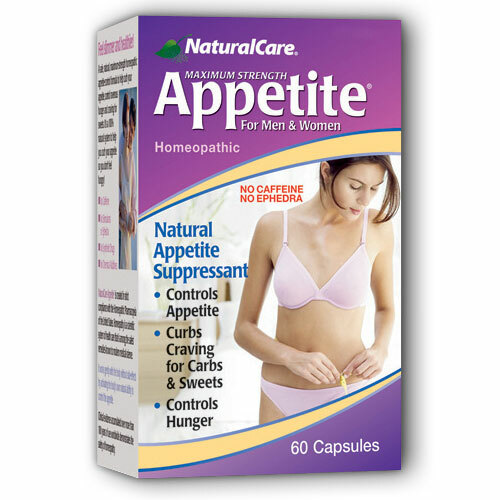 Appetite Suppressant is a safe homeopathic appetite suppressant that helps curb appetite, lessen sweet cravings, relieve hunger pains and help metabolize fat without caffeine or stimulants. A safe, maximum-strength, natural homeopathic remedy to help curb the appetite, control ravenous hunger, excessive desire for sweets, and hanger pains. An aid for effective appetite control to assist weight reduction. Ingredients: Calcarea Carbonica (calcium carbonate) 6x, 12x; Pul-satilla (wind flower) 3x, 6x, 12x, 30x, Natrumsulphuricum (sodium sulphate) 6x; Graphites 12x; Fucus Vesiculosis (sea kelp), 3x, 6x, 30x; Paullina Sorbillis 3x. Suggested Use: Take one Appetite Suppressant capsule 10 to 20 minutes before each meal, or one capsule between meals if you feel hungry, up to 10 capsules per day, or as directed by a doctor. This product’s effectiveness is directly related to the degree to which you reduce your usual daily food intake. Attempts at weight reduction which involve the use of this product should be limited to periods not exceeding 3 months, because that should be enough time to establish new eating habits. Max Trim – Women’s Weight Loss For many women, trying to look good is not just a desire; it’s a way of life. Starvation diets and "get-thin-quick" workout programs typically fail to produce weight loss and desired results. The bottom line is, you have to eat right and exercise if you expect to achieve weight loss and be healthy. However, it’s not that easy for everyone. In many cases, dieters turn to weight loss supplements to aid them in their quest for fitness and weight loss. That’s where Max-Trim weight loss for women comes in! Max-Trim women’s weight loss is a specially blended formula that increases energy and raises your metabolism allowing you to burn unwanted fat. Implementing thermogenic technology, Max-Trim can reduce your appetite while increasing your metabolism. Our proprietary blend of herbs and vitamins is completely ephedra-free and is among the most potent products on the market. What’s in Max-Trim Weight Loss Formula The ingredients are specifically formulated for women and in addition to weight loss our formula can help address female-specific issues ranging from endometriosis to menopause. Max-Trim weight loss is also used as a daily multivitamin/antioxidant that will boost your immune system Vitamins A, B3, B6, C, E, K, Iron, Zinc, Magnesium, Boron. In addition, Max-Trim also contains ipriflavone and genistein that help with hormone regulation. Finally, Max-Trim contains Indole-3-Carbinol, which is one of the major anticancer substances found in cruciferous vegetables ( cabbage family). Max Trim is a state of the art weight loss that also serves as a multi-vitamin. The formulation is geared to target common female deficiencies and help suppress your appetite. Max Ripped – Men’s Weight Loss The obesity epidemic in the United States is growing at a record pace. Over 60% of Americans are currently overweight and are looking for a weigh loss alternative. With a poor diet and lack of regular exercise, more and more people are putting themselves at risk to a multitude of long-term health problems ranging from fatigue to heart-disease. There are many fad-diets and "get-thin-quick" programs out there, but people who try those typically fail to achieve weight loss they set out to accomplish. In many cases, dieters turn to weight-loss supplements to aid them in their quest for fitness and weight-loss. Sure, we all want to have MAX RIPPED abs and lean muscle, but for others, fitness will become mandatory to ensure a long, healthy, and enjoyable life. The bottom line is you need to eat right and exercise and for many of us that’s hard to do. That’s where Max-Ripped can help. Max-Ripped men’s weight loss is a specially blended formula that increases energy and raises your metabolism allowing you to burn unwanted fat. Implementing thermogenic technology, Max-Ripped weight loss can reduce your appetite while increasing your metabolism. Our proprietary blend of herbs and vitamins is completely ephedra-free. The ingredients are specifically formulated for men to increase testosterone, endurance, and energy allowing you to exercise at the highest possible level, as well as achieving weight loss. The result is burning fat and gaining muscle. Max-Ripped also contains Yohimbe that is famous for promoting male vitality. What’s in Max-Ripped Weight Loss Formula Max-Ripped doubles as a daily multi-vitamin/antioxidant that will boost your immune system containing vitamins A, B3, B6, C, E, K, Iron, & Zinc. Max-Ripped also contains herbs like Saw Palmetto and Green Tea Extracts that contribute to a healthy prostate and fight cancer while helping weight loss. Vitamin C (ascorbic acid) Vitamin E (d-tocopherol) Vitamin K ( menaquinon) Iron Zinc Saw Palmetto Guggul 10% Guggulsterone Caffeine USP Yohimbe (6% yohimbine, 16% TA) Bitter Orange ( Citrus auranilium) 6% Synephrine Guarana ( Paullnia Cupana) 22% Thermogenic Green Tea Extract ( Camelia Sinesis 50% EGCG) White Willow Bark 50% Metabromine ( Theobromine cacao) 12% Hydroxycitric Acid ( HCA- Garcinia cambogia) Long Pepper 5% piperline When to take Max Ripped You should always take both capsules together every day. We recommend taking them in the morning with a full glass of water, however, you can take them whenever it is convenient for you. How long to take Max Ripped Our recommended dosage of Max Ripped is taking 2 capsules daily. Max Ripped will suppress your appetite and increase your energy while burning fat. You should take as a continued use product. It is also recommended to exercise and eat a sensible diet for Max results! Expected Results from Max-Ripped The typical results achieved by taking Max Ripped are: Increase Energy Suppressed appetite Effortless weight control 100% Ephedra Free Ripped body These are typical results that happen in most customers. Results will vary from person to person. Additional Benefits from Max-Ripped Our formula has many additional benefits other than the stated above. Here are a few top benefits: Max Ripped thermogenic formula will give you an instant energy boost upon taking for the first time. If you choose to exercise while taking Max Ripped your workouts will be more intense and complete. More improved blood circulation throughout your body can also be achieved. Many of the herbs promote blood flow, which can help prevent many known diseases we suffer from later on in life. In addition, to the herbs that promote effortless weight control. There are herbal ingredients that are geared for male related issues- alopecia, erectile dysfunction, BPH as well as weight loss. Max Ripped is also a complete multivitamin. Max Ripped is an extremely useful product that millions of people have been enjoying.